Hundreds of ballplayers, from Jack Graney to Alex Rodriguez, have traded their gloves for microphones. Joe Garagiola, the second-best catcher from Elizabeth Street in St. Louis, was the most successful. Branching out from his roots as a baseball announcer, he filled in for Johnny Carson as host of the Tonight Show, served two terms as co-host of NBC’s Today, and emceed network television game shows. He hardly fit the mold of a TV star: in his words, a “fat, bald Italian who drops his Gs.”1 But he was quippy, cheerful, and down-to-earth. Many television critics called Garagiola an Everyman who connected with the audience whether he was broadcasting a ball game, interviewing a poet, or describing a dog show. He held his own alongside some of the most celebrated personalities of the second half of the 20th century: Harry Caray and Vin Scully, John Lennon and Barbara Walters. Garagiola was twice honored by the National Baseball Hall of Fame, once for broadcasting and again for humanitarian service. He helped establish the Baseball Assistance Team to aid needy baseball men and crusaded against smokeless tobacco. The son of immigrants who couldn’t speak English, Garagiola grew up on “The Hill,” an Italian-American section of St. Louis. His neighbor across Elizabeth Street was Lawdie "Yogi" Berra, his best friend and the foil in many of his trademark stories. 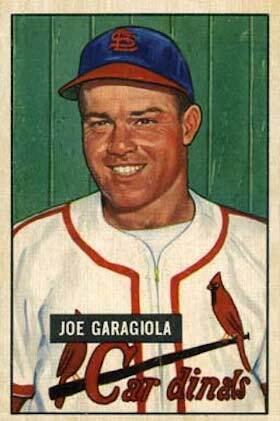 Joseph Henry Garagiola was born on February 12, 1926, exactly nine months after Berra, the second son of Giovanni (known as Big John) and Angelina Garagiola. Giovanni had come to America in 1911 from Inveruno, in northern Italy’s Lombardy region, but couldn’t bring his wife to join him until after World War I. Papas Garagiola and Berra were factory laborers. Their sons’ jobs were to fetch pails of beer for the fathers at the end of the workday. Fortunately for Joey and Yogi, they were younger sons; their older brothers had to go to work as soon as they were able. Boys on The Hill played ball in the street, painting bases on the pavement, nailing broken bats together, and liberating scarred baseballs from a sandlot team. Garagiola was a 13-year-old first baseman when a Cardinals scout, Dee Walsh, advised him to switch to catcher. The Cardinals worked him out at Sportsman’s Park and, when he was 15, hid him from other teams by sending him to their Springfield, Missouri, farm club as a groundskeeper and clubhouse boy. He did laundry for Stan Musial and other St. Louis prospects. The Cardinals signed him, illegally, shortly before his 16th birthday and sent him back to Springfield in 1942, this time as a player.2 When the season ended, he went home to earn his high-school diploma. After a second minor-league season, Garagiola turned 18 in February 1944. His draft board sent greetings. Assigned by the Army to Fort Riley, Kansas, he played on a team with much older major leaguers and didn’t embarrass himself. His unit was aboard ship bound for the Pacific Theater when the war ended in August 1945. Landing in the Philippines, Garagiola joined the Manila Dodgers, a military squad, stocked with professionals and managed by Brooklyn pitcher Kirby Higbe, that played in a ballpark riddled with bullet holes. Discharged in May 1946, he found the Cardinals eager to welcome him home. The 20-year-old later acknowledged he wasn’t ready for the majors, but the club was desperate for catching help. Owner Sam Breadon had sold the National League’s best catcher, Walker Cooper, and the designated successor, Ken O’Dea, went down with a bad back. Garagiola, a left-handed batter, won half of the regular job, platooning with 23-year-old Del Rice. Garagiola delivered two more hits and a second RBI as the Cardinals won, 4–2. After an overnight train ride to Brooklyn, they did it again, taking an 8–4 victory to advance to the World Series against the Boston Red Sox. The boy from The Hill was goggle-eyed to be sharing the diamond with players whose socks he had washed in Springfield. “I get up in the middle of the night and say to myself, ‘Hey, Joe, this ain’t on the level. You’ve been dreaming.’”6 He caught five of the seven Series games (pitcher Harry Breechen preferred to throw to Rice) and went 6-for-19 with four RBI. In Game Four he, Enos Slaughter, and Whitey Kurowski matched a World Series record with four hits apiece. Garagiola left Game Seven in the top of the eighth after Ted Williams’ foul tip split the ring finger on his bare hand. In the Cardinals’ half of the inning, Slaughter’s “mad dash” from first base brought home the Series-winning run. Garagiola’s rookie year was the apex of his career. He never made it to another World Series and never lived up to his promise. Yogi Berra followed him to the majors in September. Berra stayed a lot longer, but Garagiola made more money during his lifetime. Two years after his debut, Garagiola was carrying a .107 batting average when he was demoted to the minors for the second half of the 1948 season. He returned the next year to share the catching duties with Rice. He felt secure enough to marry Audrie Dianne Ross, the organist at Our Lady of Sorrows Catholic Church, on November 5, 1949. In 1950 Garagiola was having his best year, batting .347 on June 1, when he collided with Jackie Robinson and separated his left (non-throwing) shoulder. He missed three months, and the shoulder bothered him for the rest of his career. The Cardinals traded him to Pittsburgh in June 1951, where he turned in two decent seasons as a platoon catcher for a pitiful team. The Pirates sent him on to the Cubs as part of a deal that included slugger Ralph Kiner. He spent the final month of his career watching the Giants win the pennant and World Series. As a September acquisition, Garagiola was not eligible for the Series. He shows up, however, in some photographs of Willie Mays’s fabled back-to-the-plate catch, with the third-string catcher’s bald head poking through the window of the center-field clubhouse at the Polo Grounds. On the recommendation of the Cardinals announcer Harry Caray, Anheuser-Busch added Garagiola to the team’s broadcast booth in 1955. With Caray and Jack Buck, he beamed Cardinals games over the majors’ largest radio network, blanketing the Midwest and South. Making public appearances for the brewery, he graduated from church-basement suppers and Rotary and Kiwanis luncheons to marquee sports banquets all over the country. The comedian Jack Paar, who cared nothing about baseball, invited Garagiola to his Tonight show because he had heard that the ex-player was funny. The New York publisher Lippincott noticed and signed Garagiola to write his first book, Baseball Is a Funny Game. The slim volume, ghosted by Martin Quigley, is stuffed with anecdotes, some of them hilarious, some informative, some even true. It was the rocket engine of his career. The publisher said it became the bestselling baseball book of all time, emptying the shelves of 12 hardcover printings in the first year. NBC’s Today show brought Garagiola on for an interview to promote the book. That led to weekly spots on television’s most popular breakfast program and an assignment reporting feature stories at the 1960 World Series. The next spring NBC put him on its Saturday and Sunday Game of the Week. Garagiola provided color for play-by-play announcers Lindsey Nelson and Bob Wolff, showing off his humor and a former catcher’s insight into the game. He also appeared on World Series and All-Star Game broadcasts and continued contributing to Today. But NBC’s weekend ratings lagged behind Dizzy Dean’s on CBS. NBC gave up the games after the 1964 season. After three seasons, Garagiola left the Yankees for the biggest job of his life: co-host of Today, working with Hugh Downs and Barbara Walters, in 1967. Walters, who had been confined to “women’s features,” credited the two men with accepting her as a partner, although she was not officially a co-host. “I loved Joe Garagiola,” she said decades afterward. “It was a very happy time for me. Hugh Downs, Joe Garagiola, and me. I think we were very good and very compatible.”11 Today was the launch pad that made her the first million-dollar news anchor and a TV icon. Today’s predawn wakeups burned Garagiola out. He left after six years, admitting he had neglected his family and grown a swelled head. He had kept his hand in baseball, producing mini-documentaries for his pregame shows when NBC resumed regular-season broadcasts. The Baseball World of Joe Garagiola won a Peabody Award, television’s equivalent of the Pulitzer Prize, in 1973. In the fall of 1976 Garagiola stepped from the World Series booth into a role alien to his roots in sports or TV. He agreed to campaign with President Gerald Ford — because he was honored that Ford asked him, he said. Ford and his handlers saw a chance to wrap the unpopular president in Garagiola’s Everyman cloak. Fronting a series of infomercials in a town-hall format, Garagiola fed the candidate puffball questions supposedly asked by voters. Critics ridiculed “The Joe and Jerry Show.” Neither NBC nor Chrysler was happy, but both felt powerless to oppose the president’s wishes. After all, the federal government regulated their businesses. Ford lost the election; Garagiola never expressed regret for his participation. How could he regret it? It was the American dream in living color, the immigrants’ son standing beside the president of the United States and having a sleepover in the White House. The ratings climbed in 1984 when a new contract gave NBC exclusive rights on Saturday afternoons, with no competing local TV games. In the contractual tangle of television baseball, it was NBC’s turn to show the World Series; ABC had the Series in alternate years. The previous October ABC had crammed four announcers into its booth.22 NBC stuck with its two regulars, to widespread acclaim. The Sporting News’s Jack Craig called the 1984 Series coverage “a pinnacle of televised sports.”23 There were dissenters. Christine Brennan of the Washington Post complained, “Garagiola is up to his old tricks, aah-ing and cliché-ing his way through the Series.”24 Baseball broadcasters, like broccoli, are a matter of taste. After working his ninth World Series on NBC-TV in 1988, Garagiola angrily walked away from the job that paid him an estimated $800,000 a year. He said the network brass had left him dangling for months while reportedly trying to hire the recently retired pitcher Tom Seaver. NBC was also negotiating for a new contract with Major League Baseball, and would end its long association with the sport a year later. Garagiola called some California Angels games in 1990, but NBC wasn’t finished with its Everyman. The Today show, forever king of the morning hill, fell behind ABC’s Good Morning America. NBC shot itself in the foot when it replaced co-host Jane Pauley with a younger and blonder woman, alienating many viewers. In 1990 the network turned to the 64-year-old Garagiola to placate longtime fans and repair the toxic chemistry on the set. Part of his job description was to warm up co-host Bryant Gumbel, who had sought Garagiola’s advice about switching from sports to news and entertainment broadcasting. Garagiola made Gumbel smile, but the ratings didn’t improve much until Katie Couric became co-host in 1991. Garagiola stayed for 20 months before he tired of commuting to New York from his home in Arizona. 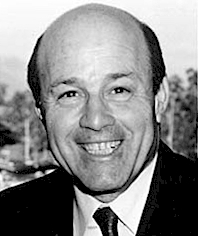 Garagiola returned to baseball as an occasional broadcaster for the Arizona Diamondbacks, where his son Joe Jr. was general manager. His son Steve worked in TV news, and his daughter, Gina Bridgeman, collaborated on her father’s second book, It’s Anybody’s Ballgame. Health setbacks ended his 57-year broadcasting career after the 2012 season. At the request of Commissioner Peter Ueberroth, Garagiola had founded the Baseball Assistance Team (B.A.T.) in the 1980s, along with former Dodger pitchers Ralph Branca and Joe Black. B.A.T. provided financial help, confidentially, to former players and the coaches and scouts who had labored long in the game for low pay. In the 1990s Garagiola began campaigning to rid baseball of smokeless tobacco, a known cause of cancer. Many players wouldn’t listen, but pitcher Curt Schilling said Garagiola’s persistence helped save his life. Several major-league cities have banned the products from their ballparks. In 2014 the Hall of Fame honored Garagiola’s service with the Buck O’Neill Lifetime Achievement Award. Garagiola died on March 23, 2016, survived by Audrie, his wife of 66 years, and their three children. 1David Zurawik, “Joe Garagiola: easy-ing his way back to Today,” Baltimore Sun, June 11, 1990: 1B. 2 According to legend, the Cardinals passed on Berra, but Garagiola said St. Louis general manager Branch Rickey knew he would soon be moving to Brooklyn and wanted Berra for the Dodgers. Too late; the Yankees signed him. 3 Curt Smith, Voices of the Game (South Bend, Indiana: Diamond Communications, 1987), 423. 5 Frederick Turner, When the Boys Came Back (New York: Henry Holt, 1996), 216. 6 J.G.T. Spink, “Looping the Loops,” The Sporting News, October 23, 1946: 1. 7 Rick Hummel, “Catcher, broadcaster and Hill icon Joe Garagiola dies at 90,” St. Louis Post-Dispatch, March 23, 2016. http://www.stltoday.com/sports/baseball/professional/joe-garagiola-catcher-broadcaster-and-hill-icon-dies-at/article_48231a86-b3af-53d1-aa06-2887927e13a6.html. 8 Joe Garagiola, Baseball Is a Funny Game (New York: Bantam, 1962), 149. 9 Garagiola, It’s Anybody’s Ballgame (New York: Contemporary Books, 1988), 164. 10 Red Barber and Robert Creamer, Rhubarb in the Catbird Seat (Garden City, New York: Doubleday, 1968), 313-314. 11 “Barbara Walters on her Today show colleagues,” Archive of American Television, https://www.youtube.com/watch?v=eiGn-9A-wGs, accessed March 26, 2016. 12 Smith, Pull Up a Chair: The Vin Scully Story (Washington: Potomac, 2009), 152. 13 Stephen Battaglio, From Yesterday to Today (Philadelphia: Running Press, 2011), 92. 14 Richard Sandomir, “Joe Garagiola, an Everyman on the Field and in the Booth,” New York Times, March 24, 2016: B14. 15 Garagiola hosted these game shows: He Said, She Said, Sale of the Century, The Memory Game, Strike It Rich, and To Tell The Truth. 16 Smith, Voices, 427, 421. 18 Hot Stove, MLB Network, February 21, 2013. http://m.mlb.com/video/v25607067/garagiola-looks-back-on-favorite-moments-of-career, accessed March 24, 2016. 19 Marty Noble, “Baseball, Broadcasting Legend Dies,” mlb.com, March 23, 2016. http://m.mlb.com/news/article/168709672/joe-garagiola-dies. 20 Smith, Pull Up a Chair, 152. 22 The ABC quartet comprised Al Michaels, Howard Cosell, Reggie Jackson, and Earl Weaver. 23 Jack Craig, “NBC’s Series Coverage Glorious,” The Sporting News, October 29, 1984: 12. 24 Christine Brennan, “Fit to be Tied: 1 Win, 1 Loss in Booth, Too,” Washington Post, October 12, 1984: D8. 25 “Baseball Hall of Fame Remembers Joe Garagiola,” baseballhall.org, http://baseballhall.org/news/joe-garagiola-passes-away, accessed March 26, 2016. 26 CNN Morning News, February 12, 2001. http://www.cnn.com/TRANSCRIPTS/0102/12/mn.11.html, accessed March 26, 2016. 27 NBC Nightly News, March 23, 2016. http://www.nbcnews.com/nightly-news/video/joe-garagiola-hall-of-fame-sportscaster-and-mlb-catcher-dies-at-age-90-651087939579, accessed March 26, 2016.